Even as Rogue One prepares to shoot and sneak its way into theaters on December 16, Disney is getting ready to revisit its latest Star Wars success: The company will release a new 4-disc Collector’s Edition of The Force Awakens, complete with a full commentary track from director J.J. Abrams, on November 15. Yahoo! has an exclusive excerpt from said track, in which Abrams discusses how his old friend, Selma director Ava DuVernay, helped him build up the film’s final confrontation between nascent Jedi Rey and her nemesis, Kylo Ren. DuVernay—who Abrams has said he’d like to see direct a Star Wars picture of her own—looked at a rough cut of the movie, and suggested the addition of a quick shot showing Daisy Ridley’s face as she strikes the Sith Lord down. 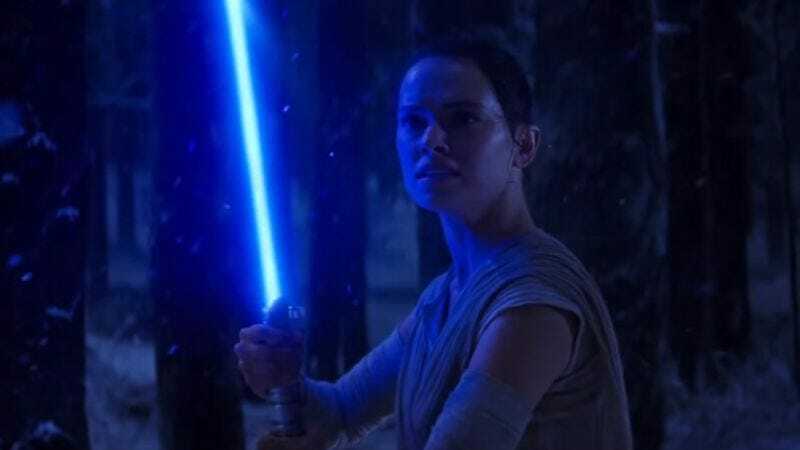 As Abrams notes, “It’s a little thing, but it really connects you to her intensity.” He also discussed another sequence, earlier in the scene, where he added a long, quiet pause, to show Rey’s burgeoning connection to the Force take hold. It’s a small addition, but a good reminder of how deliberate every seemingly tossed-off moment in a big-budget blockbuster can be. Abrams is currently focusing on movie production—like the upcoming God Particle—and hasn’t announced his next feature film. DuVernay, meanwhile, just released her prison documentary 13th, and is currently directing A Wrinkle In Time for Disney.